Guy Johnson (c. 1740-1788), came to America from Ireland in 1756. 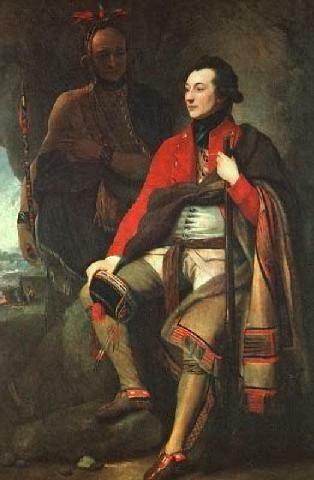 Because of his abilities and diligence in serving the British and his uncle, Sir William Johnson, during the French and Indian War, he was made Deputy of Indian Affairs in 1762. Commissioned a colonel of the local militia and important in the ' judicial affairs of Tryon County, he assumed the duties of Superintendent of Indian Affairs upon Sir William's death in 1774. In 1763 guy married his cousin Mary ("Polly"), Sir William's daughter. As a wedding present, Sir William gave them a square mile of property along the flatlands of the Mohawk River. The first home was struck by lightning and destroyed in the spring of 1773. It was soon replaced by a new house of block limestone, called Guy Park and today in Amsterdam, New York. Guy Johnson sided with the British at the outset of the Revolutionary War. This brought immediate reaction from local patriots, including threats of imprisonment to keep him from arousing the Iroquois against them. The situation became so explosive that in 1775 Johnson gathered together his Mohawk allies, his fellow loyalists, and his family and fled to Canada. He had lived in his new home less than a year. While on this flight, Polly died in childbirth at Oswego. After making treaties with the Iroquois in Canada to insure their continued support, Guy sailed to England at the end of 1775. He returned to America in 1776 and for two years lived in British-occupied New York City. By 1779 he had established his headquarters at Niagara, where he directed but did not participate in raids on the Mohawk Valley. Guy Johnson returned to England after the war and died in London in 1788. About this portrait of Guy Johnson from the National Gallery, Washington, D.C.